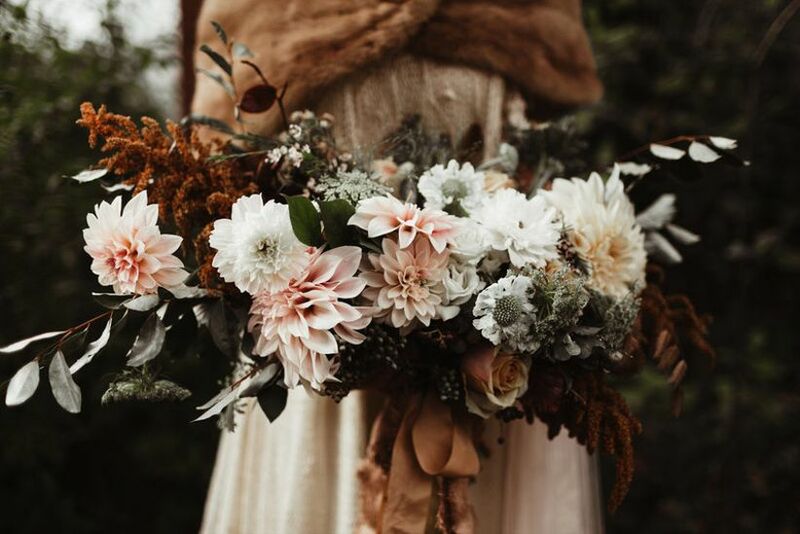 Sunflowers, roses, dahlias, and mums (okay, basically any flower that blooms in a shade of yellow or orange) are among the most popular fall wedding bouquet ideas, and we won't argue that they're stunning! But if you're on the hunt for bouquet ideas that are a bit more out of the ordinary, we've got your back. 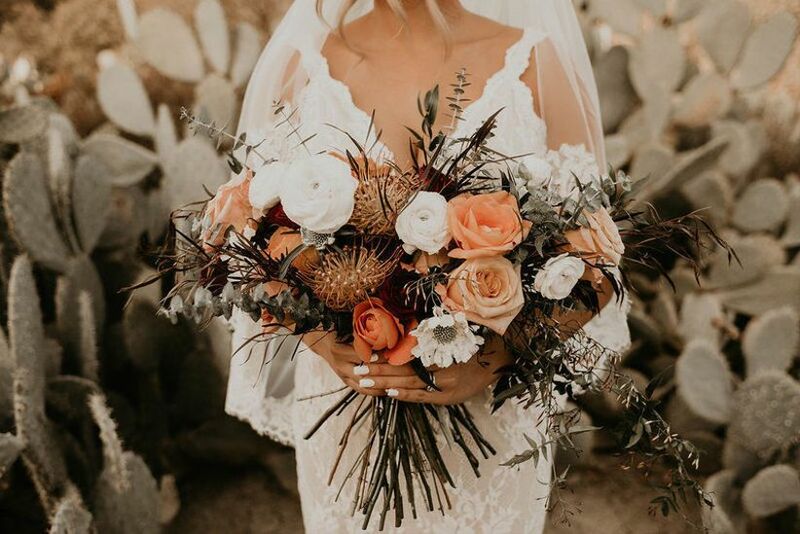 There are dozens of ways to spice up your fall wedding bouquet, from boho chic feathers to statement-making proteas. Below, we're sharing some of our faves. 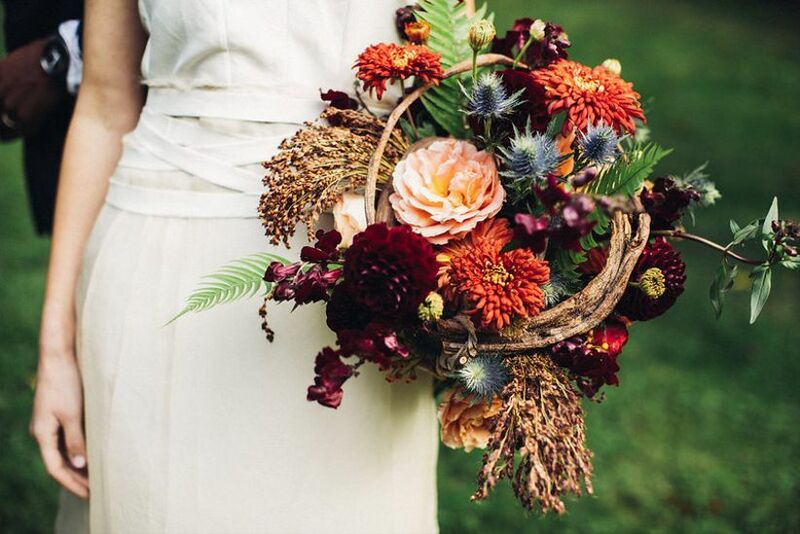 Check out these creative fall wedding bouquet ideas. Pincushion proteas are a playful and modern accent to classic-looking roses and scabiosa, but somehow, it works! 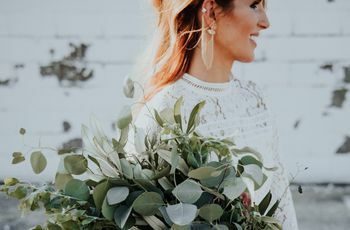 The added greenery creates a cool abstract look that suits any boho bride. These plants are some of our favorite year-round accents (get more succulent ideas right here! ), but they look especially lovely in a fall wedding bouquet. Pair succulents with greenery and hypericum berries for an eco-chic vibe. 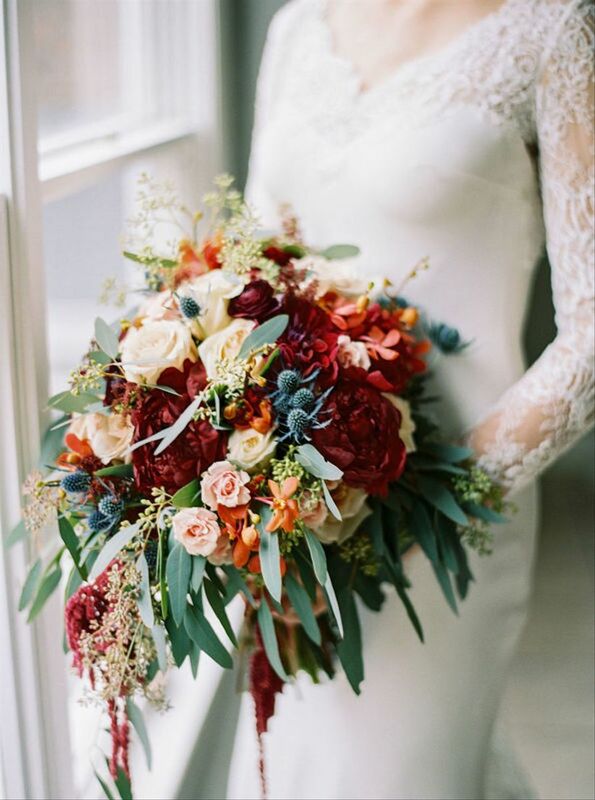 Embrace this unique fall wedding color palette by adding blue thistle and dark orange roses to your bouquets. 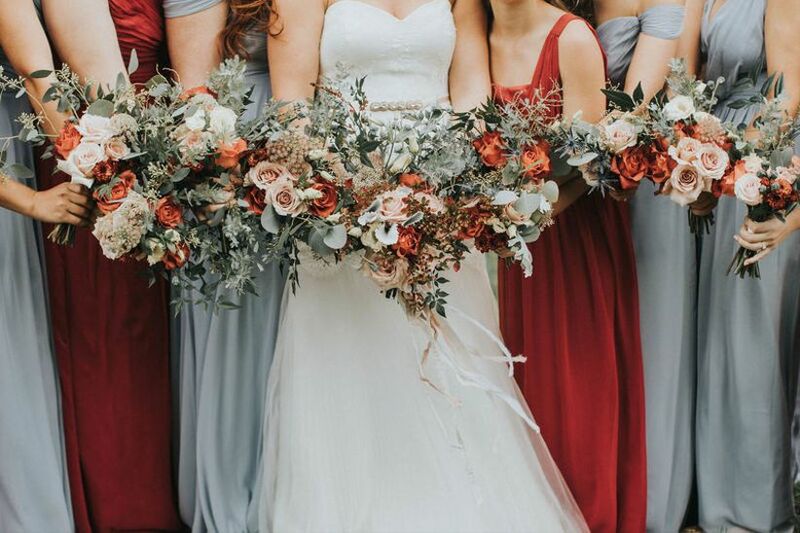 Soft eucalyptus and blush pink hues tone down the blue and orange flowers, giving them a more versatile look that's still unexpected. 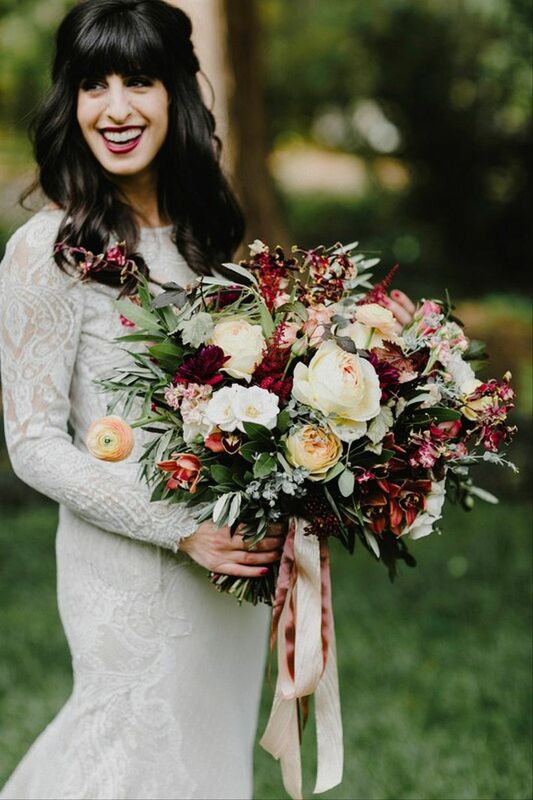 Create an ultra-romantic look by accenting your fall wedding bouquet with flowering vines that trail down from the edges. Some of our favorite vine options include clematis and jasmine. 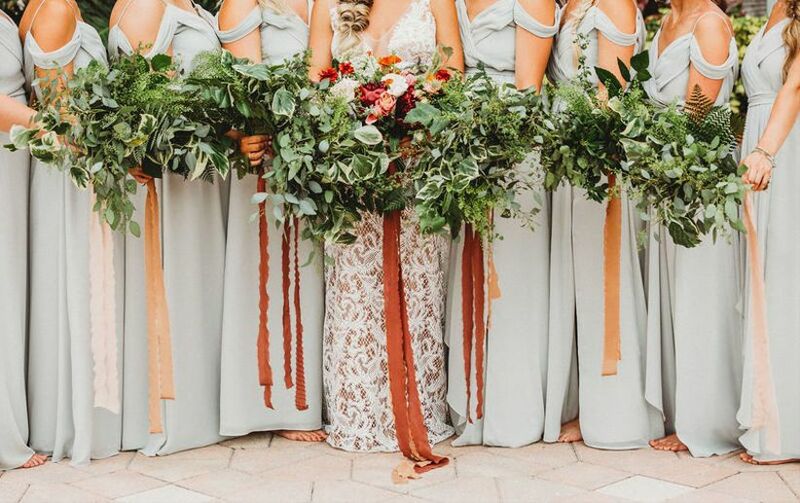 Speaking of vines, even the dried ones can serve as a gorgeous accent to your wedding bouquet. This architectural bouquet includes dahlias, chrysanthemums, thistle, and ferns molded around a halo of grapevine. Not a huge fan of flowers? No problem! 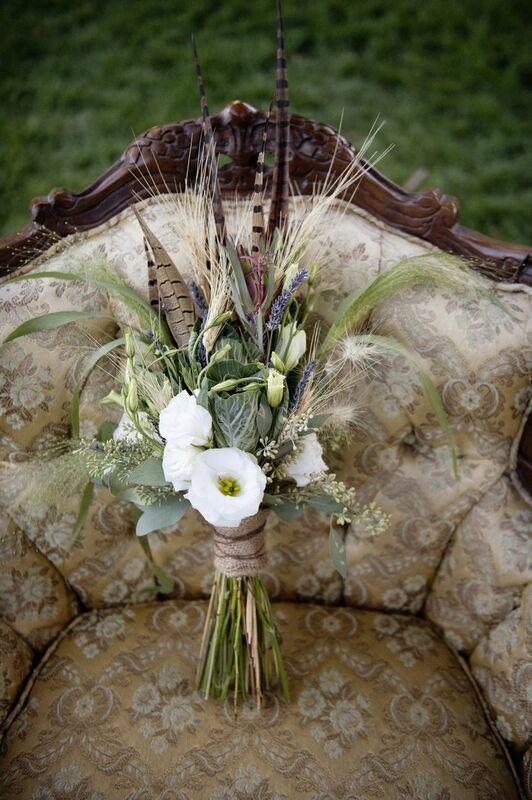 Feathers, wheat stalks, and greenery are all trendy alternatives to over-the-top blooms. 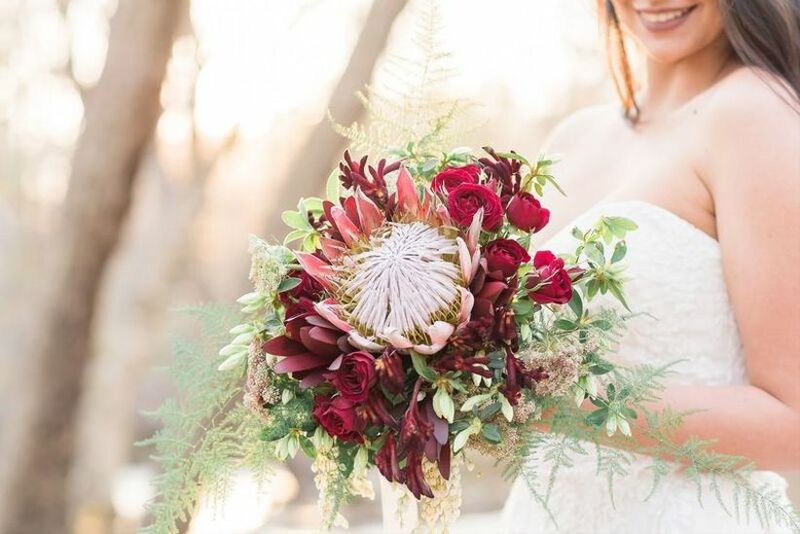 King proteas were made for the statement-loving bride. 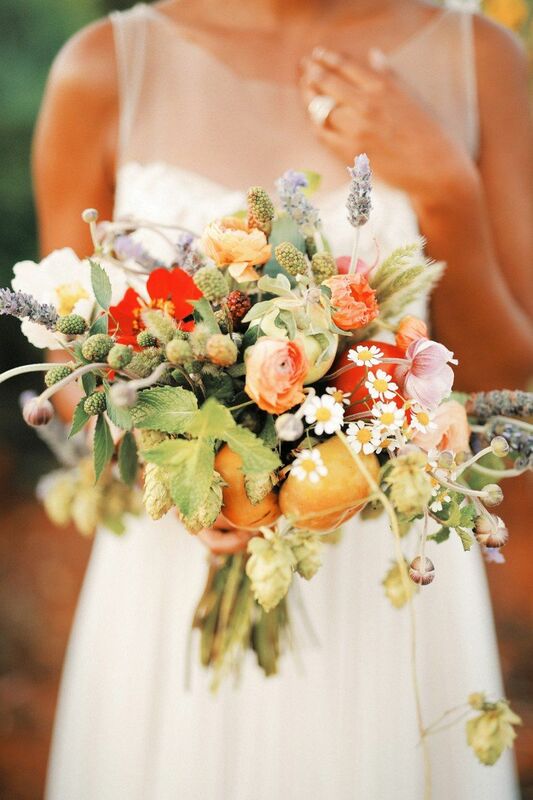 One is all you need to add the "wow" factor to your fall wedding bouquet. 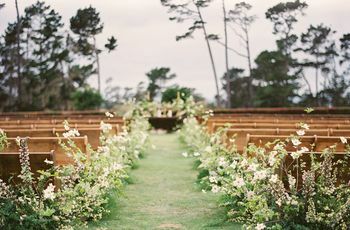 We love how this one is paired with dark red flowers and airy greenery. Combine dark and light flowers into one bouquet by using a subtle ombré effect. Look closely and you'll see how the lightest flowers are clustered to the right — with a pop of blue delphinium for good measure — while the darker blooms are on the left. This elegant arrangement proves that not every bouquet has to be symmetrical! 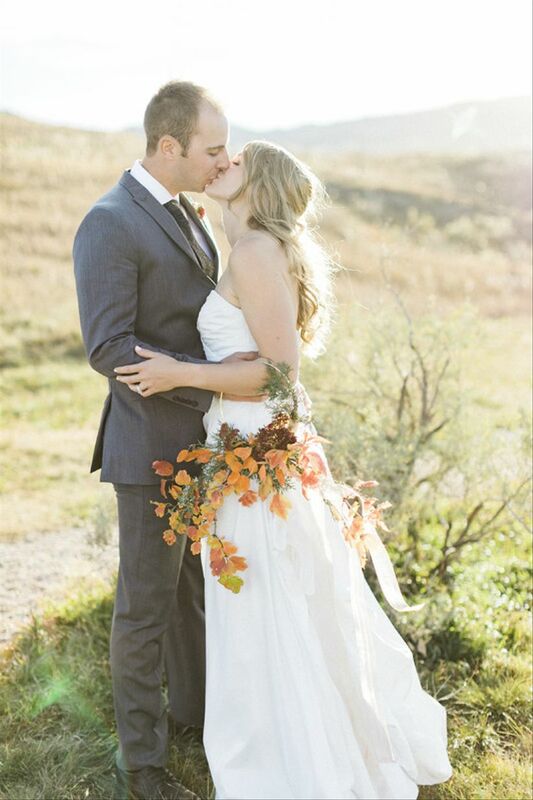 If you're really feeling adventurous, skip the handheld bridal bouquet and opt for a bridal wreath instead! Wreaths and hoops are trending in wedding decor, but they make a total statement as bridal accessories, too. This one features orange fall foliage. The best part: When you're tired of carrying it, you can simply loop it over your arm! As the saying goes, go big or go home! 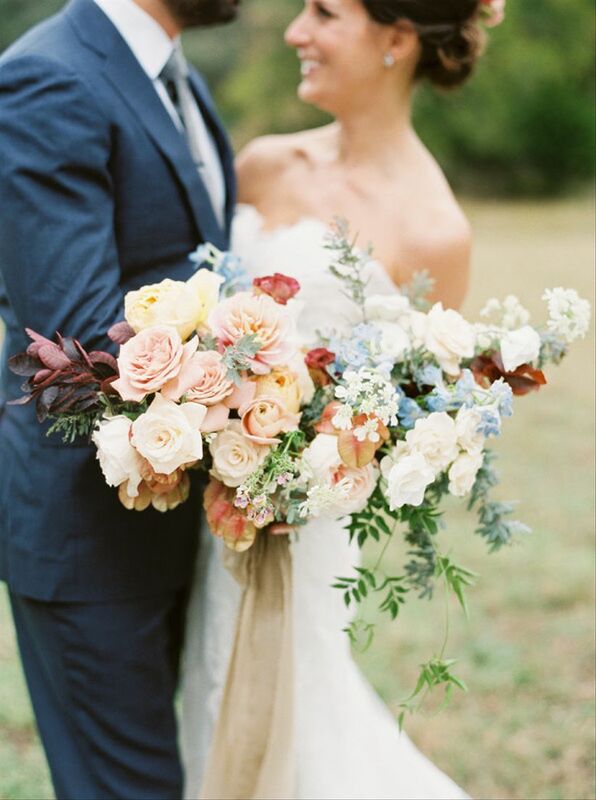 Oversized bouquets have been trending for several seasons now, but they still make our jaws drop. 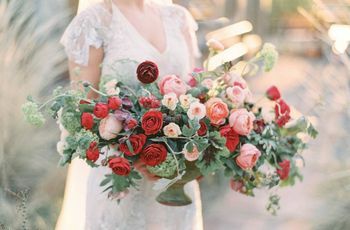 This bouquet style is typically asymmetrical and even a bit untamed at times, which is what gives it so much personality. But if you don't like the asymmetrical look, a giant rounded bouquet offers the same oversized effect while being a bit more reigned in. 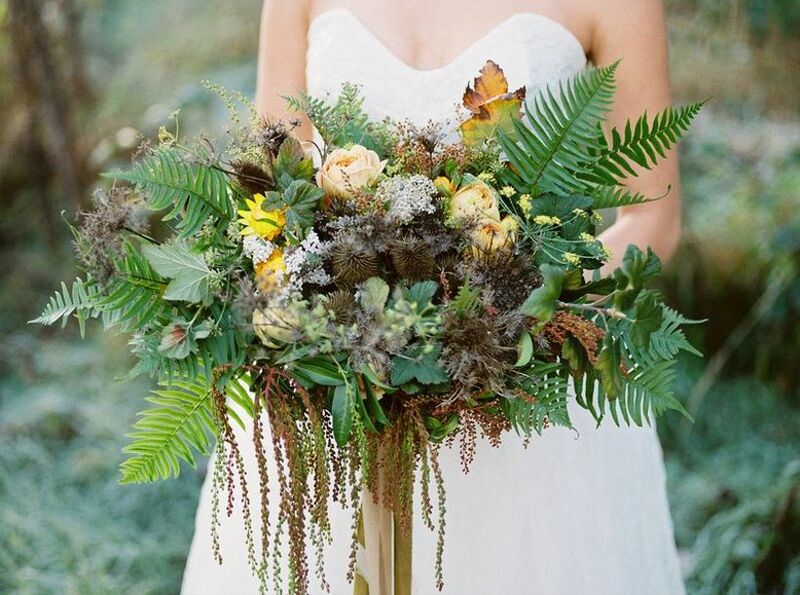 For a bouquet that has a woodland-inspired look, go heavy on the greenery and wildflowers. Add dried accents, like thistle, and a dash of color for a truly enchanting, picked-from-the-forest result. 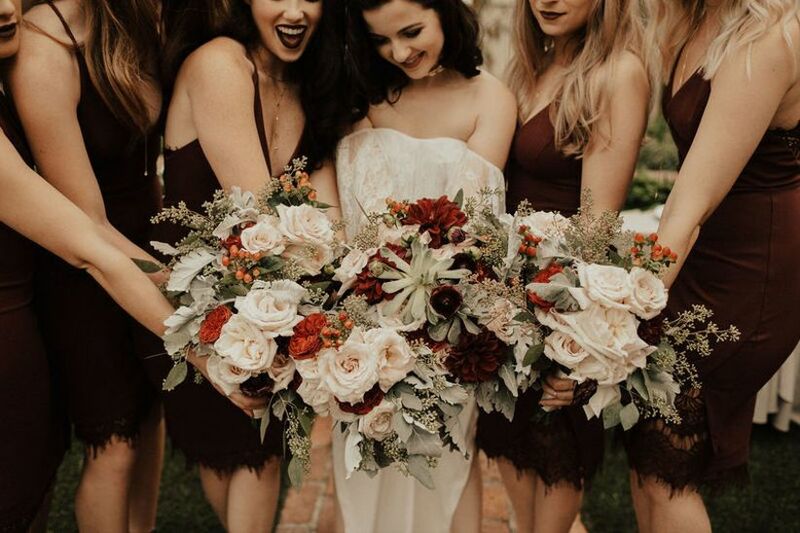 The dark and moody wedding trend is perfect for fall brides. 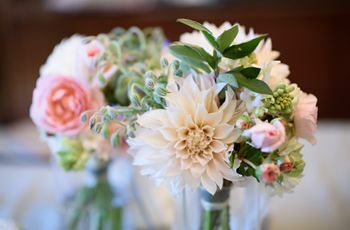 Offset a bouquet of blush dahlias and white carnations with rust-colored amaranthus, blue viburnum berries, and purple agonis. Tomatoes in a wedding bouquet? Why not! Take advantage of the seasonal harvests by including fresh veggies or herbs in your floral arrangements. 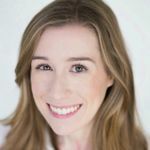 This non-traditional idea is surprisingly photogenic, and it's especially great if you're getting married at a farm or pastoral venue that supplies its own produce. 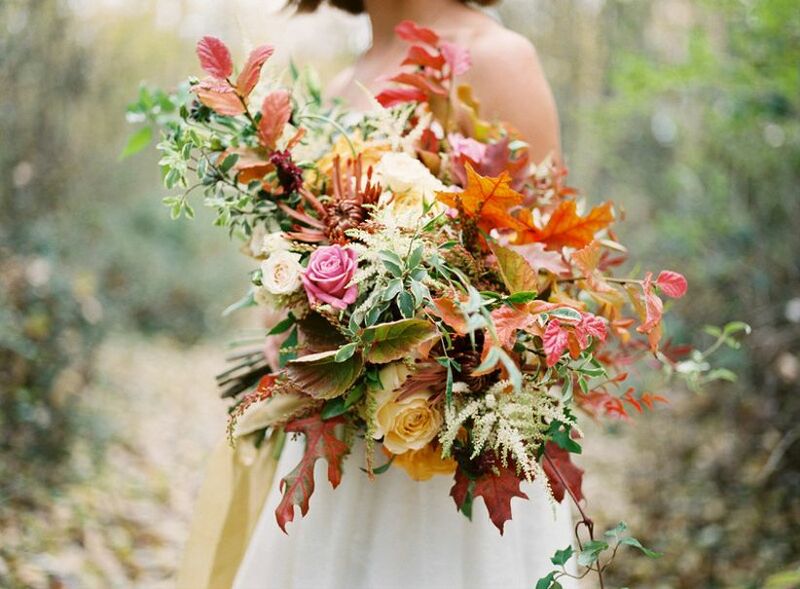 Put an autumnal spin on any bouquet by including a few well-placed branches of fall foliage. A cascading wedding bouquet is traditional with a twist. 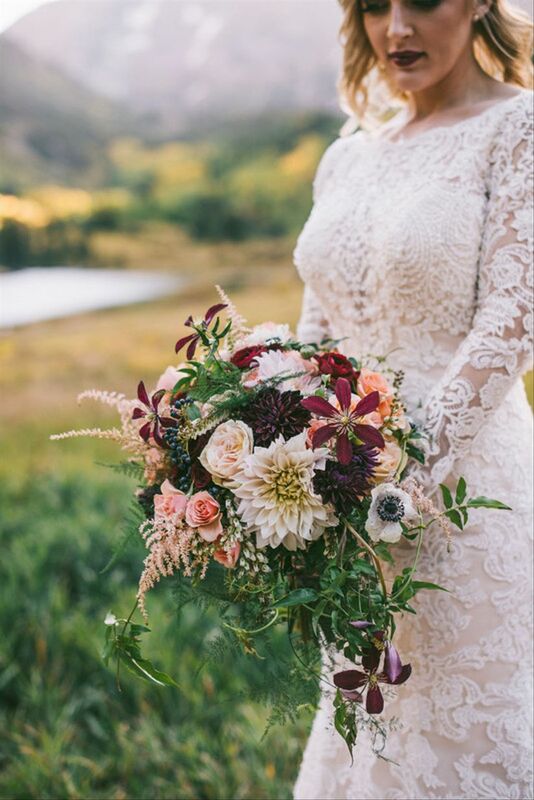 For fall brides, we love the lush look of this peony and rose arrangement accented with thistle, amaranthus, and seeded eucalyptus.